The Filmfare Best Actress Award is given by the Filmfare magazine as part of its annual Filmfare Awards South for Tamil (Kollywood) films. The awards were extended to "Best Actress" in 1972. The year indicates the year of release of the film. ^ a b "sathumpodaathay/images/sep2007/profile_content_new-1". im.sify.com. Archived from the original on 5 March 2016. Retrieved 20 June 2015. ^ Rashtriya Sahara. Sahara India Mass Communication. 1996. Retrieved 20 June 2015. ^ "Filmfare Awards". web.archive.org. Archived from the original on 10 October 1999. Retrieved 20 June 2015. ^ Competition Science Vision. Pratiyogita Darpan. p. 791. Retrieved 20 June 2015. ^ "Star-spangled show on cards". The Hindu. Archived from the original on 15 July 2006. Retrieved 20 October 2009. ^ Kannan, Ramya (24 March 2001). "Trophy time for tinseldom". The Hindu. Chennai, India. ^ "Nuvvu Nenu wins 4 Filmfare awards". Times of India. 6 April 2002. Retrieved 23 April 2017. ^ "Madras Talkies Accolades". Madrastalkies.com. Archived from the original on 14 May 2006. Retrieved 5 July 2009. ^ Kamath, Sudhish (14 June 2004). "Damp fare at the Filmfare". The Hindu. Retrieved 23 April 2017. ^ Warrier, Shobha (2 February 2006). "Sandhya: the Saritha of 2006". Rediff. Retrieved 9 December 2018. 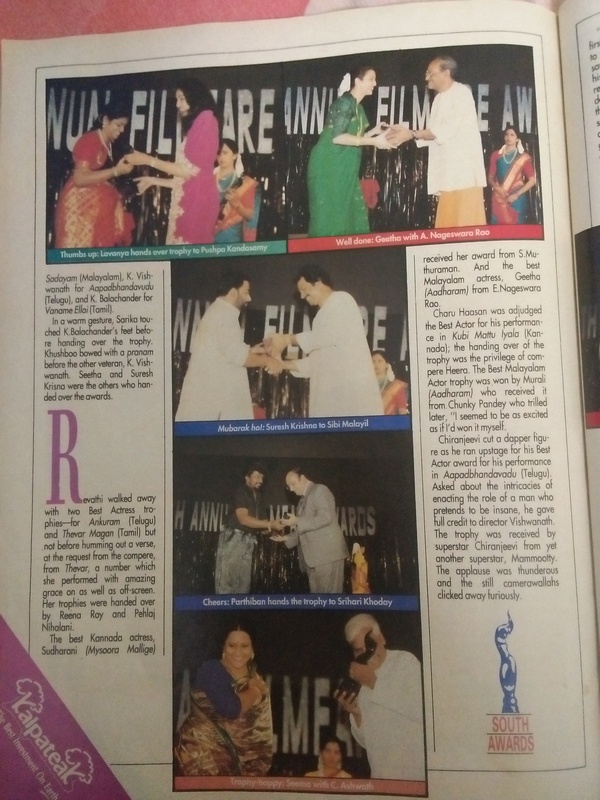 ^ "'Anniyan' sweeps Filmfare Awards!". Sify. 10 September 2006. Retrieved 23 April 2017. ^ "Ajith Bhavana win Filmfare awards - Tamil Movie News". indiaglitz.com. Retrieved 20 June 2015. ^ "Paruthiveeran dominates Filmfare awards - Behindwoods.com Ameer Karthi Priyamani Saravanan Sujatha K V Anand A R Rahman Sivaji Unnale Unnale Mozhi Kreedom movie news picture gallery stills images". behindwoods.com. Retrieved 20 June 2015. ^ Ramanjuam, Srinivasa (2 August 2009). "The glowing filmfare night!". The Times Of India. ^ "Vedam wins big at Filmfare Awards (South) 2011". Rediff.com. 4 July 2011. Retrieved 23 April 2017. ^ "The 49th Annual Filmfare Award - South". The Times Of India. Archived from the original on 23 May 2013. 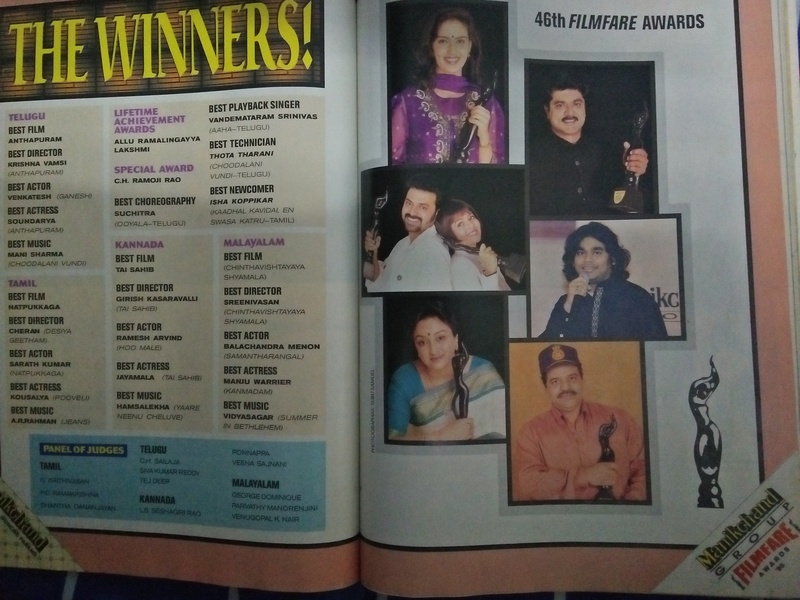 ^ "Pithamagan sweeps FilmFare Awards - Tamil Movie News". indiaglitz.com. Retrieved 20 June 2015.